March 27, 2018 - Reno, NV - NuLegacy reports that late winter storms have deposited as much as three feet of snow on parts of its 38 sq. 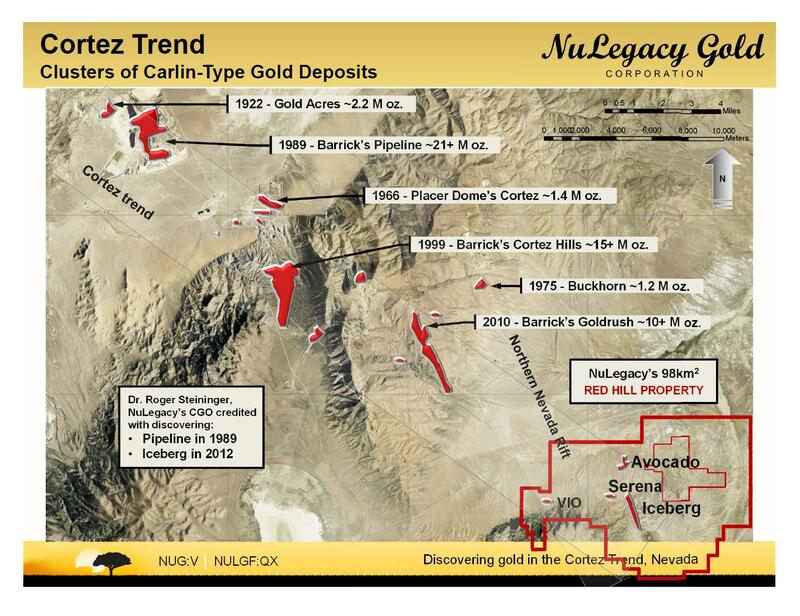 mile Red Hill property in the Cortez gold trend of Nevada. Several storms have swept through the area during the past two weeks, making access to the property difficult, and access to selected drill target areas difficult and dangerous. "Spring snow storms are not unusual in north central Nevada", said Chief Geologist Derick Unger, "And this last ten days is setting a record for March". NuLegacy had to release the reverse circulation drill rig it had contracted to begin drilling in late March and was able to replace it with a drill scheduled to arrive late April, by which time the ground should be sufficiently dried out to permit safe efficient access. Initially drilling will focus on following up on the 2017 success in the Serena and Avocado zones in areas with broad intervals of intense alteration, silicification, and decalcification seen in several of the drill holes in this large exploration area. NuLegacy has enrolled Ingrain Group Inc. of London, Ontario to provide investor relations services for a period of six months commencing March 15, 2018 for total consideration of CDN $15,000. NuLegacy's Red Hill Project is located on trend and adjacentii to the three multi-million ounce Carlin-type gold deposits (the Pipeline, Cortez Hills and Goldrush deposits) that are amongst Barrick Gold's largest, lowest cost and politically safest gold minesiii. i To date, there has been insufficient exploration to define a mineral resource and it is uncertain if further exploration will result in the target being delineated as a mineral resource. iii As extracted from Barrick's Q4-2013 and Q1-2014 reports. As reported by Barrick, the Goldrush resource contains 8,557,000 indicated ounces of gold within 25.78 million tonnes grading ~10.57 g/t and 1,650,000 inferred ounces within 5.6 million tonnes grading ~9.0 g/t.